NAUT: Post-Punk/Goth Rock band from Bristol and their new album! NAUT are a 5 piece Post-Punk/Goth Rock band from Bristol, England whose shared love of classic rock and metal, along side reverence for the goth and post-punk pioneers of the late 70s and 80s makes itself known from the start. The songs switch from raw gothic tribal tom beats to uplifting anthemic synth in a moment, but always stay danceable and perhaps most dangerously, catchy. 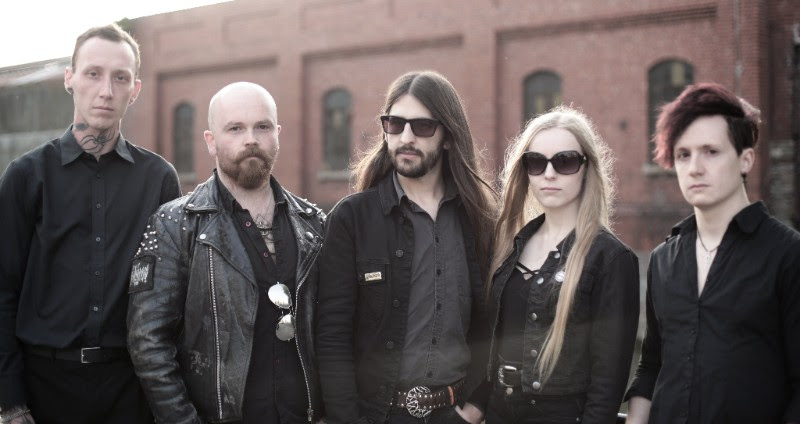 Driving basslines and pounding drums create a dynamic and shifting rhythm section to support the interwoven guitar and synth lines, which create harmonies more akin to NWOBHM than a straight up Goth revival band. The lyrics emerging from the hypnotic riffs carry a theme of otherworldly exploration, removing self imposed limits and realising your Will. To explore the self and the world we inhabit to the fullest is a recurring call, with occult and alchemical imagery, double meanings and lines open to interpretation making the songs as shifting and hard to pin down as the world they describe. Musically standing apart from contemporary post-punk revival bands, NAUT brings something new to the table and the 80s back to where they should be, here. After a string of electrifying shows as both headliners and main support for acts including GRAVE PLEASURES and COLD IN BERLIN, NAUT have ushered their debut EP into the world. ‘Raise the Lights’ was recorded late in MMXVII at RS Studios in BRISTOL by Jamie Elton and was mastered by Orgone Studios (ULVER, GRAVE PLEASURES, GHOST).